Dividing and conquering isn’t only a good method for tackling tasks at work, it can also be a great way to get more from a workout. By splitting a squat—performing the move with the onus on one leg at a time—the benefits are increased. The working leg gets nearly double the resistance and both limbs get an equal amount of training to help even out strength imbalances. There’s also no way to “cheat” by allowing the stronger glute to take over, which could happen in the squat’s traditional version. It’s best to first master the move without dumbbells. Stand about two feet in front of a bench or step. The higher the platform, the more difficult the exercise, but even the slight boost from something like a yoga block is a good start. Extend one leg back, resting the top of that foot on the edge of the platform. Relax arms, set shoulders down and lean the torso slightly forward from the hips so the burden of supporting the body is on the front leg. The higher the back leg, the more weight on the front one. The greater the burn. Bend the front knee to a 90-degree angle, lowering the torso down toward the floor, like an elevator. Keep the weight distributed evenly on the front foot—don’t rock forward onto the toes or backward onto the heel. Engage the glute and press the foot into the floor to re-straighten the front leg. 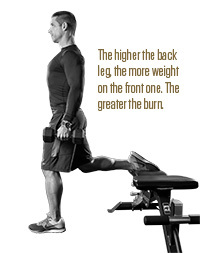 That’s one rep. Do 8 to 12 more, then switch legs. After establishing good balance and full range of motion, add a pair of dumbbells to up the challenge.